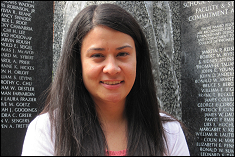 Aileen joined the Department of Aerospace Engineering this past June as the Assistant Director for Undergraduate Studies. Prior to this role she served as the Peer Programs Coordinator for the University of Maryland Learning Assistance Service. What drew Aileen to the Department of Aerospace Engineering was her interest in fostering student development and academic success in highly motivated undergraduate students. She is excited to begin forming connections and building relationships with all the students, faculty, and staff in the department. Aileen completed her B.A. at the University of Wisconsin before obtaining her M.Ed. from Pennsylvania State University. She is currently working part-time on her Ph.D. from the University of Maryland in the College Student Personnel program. Students, faculty and staff are welcome and encouraged to meet and interact with Aileen. She may be reached via email at anhentz@umd.edu. Her office is located in 3178 Glenn L. Martin Hall.